Firmly rooted in hard EBM and with a hand for memorable melodies, the trio has found its very own niche in the Electro scene. Their music presses forward with force and aggression, yet always keeps an eye on catchiness and emotions. Where most groups seem to deem it necessary to choose between emotions and aggressive force, Dennis Schober, Michael Thielemann and Steve Graeber have realized early in their career that their music is the most effective combining both attributes. 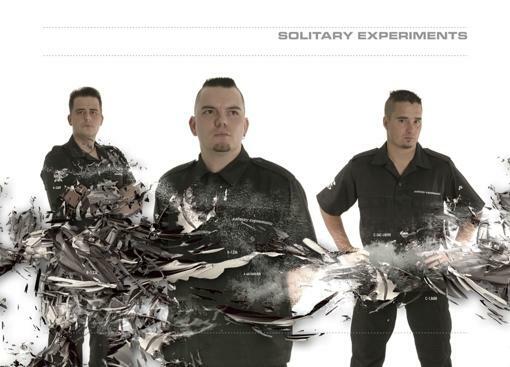 Solitary Experiments formed in 1994, in Berlin and managed to gain a rather solid reputation within the scene with their first three releases "Final Approach", "Paradox" and the remix album "Final Assault" . With their debut for Out of Line "Advance into Unknown", the group then had their final break-though in the scene. The following double-EP "Cause and Effect" helped to cement their status as darlings of the press and Electro-aficionados, while numerous tracks on compilations, tours with bands like Icon of Coil, [:SITD:], Neuroticfish, Funker Vogt and Blutengel, as well as headlining gigs and festivals all across Europe and the USA made Solitary Experiments a band that no Electrohead could pass by. 2005's "Mind Over Matter" sported a picture perfect mix of Synth Pop and massive EBM-sounds and, thus, increasing the German trio's following manifold. In 2006, the long-deleted first three albums of the band were re-released and one year later, Solitary Experiments followed up with another club smasher: "Compendium." Basically a remix-album, the CD also featured some massive collaborations with other artists, such as Feindflug or Agonoize. With the next album “In The Eye Of The Beholder”, the Berlin-based band showcased its versatility once again. It contains the club hits “Immortal” and “Rise And Fall” and quickly advanced to the most successful long playing album in the band’s career. Picking up the successful thread from the previous but further evolving the sound, the record showcases a perfect fusion of emotional depth and club-driven beats. In 2010, Solitary Experiments were celebrating their 15th anniversary of working as a band. In honor of this special jubilee, they not only released the CD “Compendium 2” which features unreleased, collaborations, mixes, versions, as well as rare remixes they did for others, but also organized a commemorative festival in their hometown to celebrate the occasion which sold out weeks in advance. This music doesn't need distorted vocals or a spectacular stage show... Solitary Experiments is just a synonym for top-quality electronic Pop music.